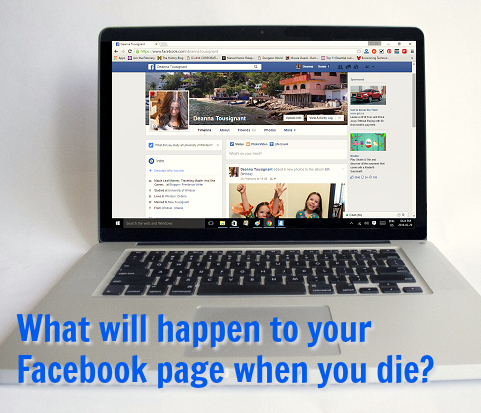 Have you ever wondered what will happen to your Facebook page when you die? Will it just sit there? Will it get deleted? What would you like to have happen with your page? Would you prefer to have your page turned into a memorial? Or would you like it all to just disappear? I discovered that you can have a say in the matter if you make the choice now and let Facebook know your preferences. I stumbled into this information while I was in the process of memorializing my Dad’s Facebook page. Memorializing his page ended up being far simpler to set up then I would have imagined. Yet, I was still left wondering two things; first, what would my Dad have preferred, and secondly, what will happen to my own page when I die? If you want your Facebook page to be deleted after you die, you need to go in and tell Facebook right now. It’s easy to do. It’s just a matter of heading into settings and checking off a box. look under Settings > Security > Legacy Contact. Of course Facebook still won’t know you’ve passed away until someone steps in and attempts to set your account to memorial status. 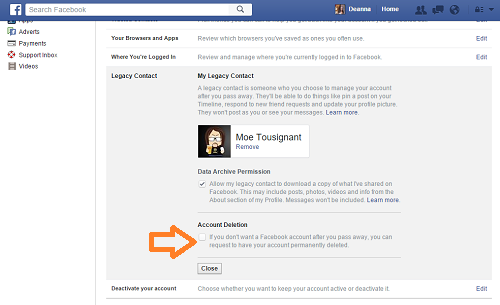 Now, when and if someone does contact them, Facebook will know that you prefer to have your account deleted. Personally, I don’t want my Facebook content to disappear after I die. I would prefer to have my page memorialized, which is what I told my husband. While going through the forms for memorializing my Dad’s page I discovered Facebook provides the option to appoint someone as your “legacy contact”. So, I didn’t just tell my husband my preference, I also set him up as the executor for my Facebook page. If you would prefer to have your Facebook page become a memorial wall after you pass away, you can simply chose to do nothing or you can set someone up as the Legacy Contact for your Facebook page. If you do nothing, after you pass away a family member or friend can still easily fill out the memorialization request form and have your page toggle over to “Remembering” mode. If you chose to set someone up as the Legacy Contact for your Facebook page they will have some power over your page. They won’t gain full access. They won’t be able to log in and read your personal private messages, for example. But in the event of your death they will be able to post to your wall, informing your friends of what has happened to you. To set up a Legacy Contact you head to Settings, Security, and then Legacy Contact. You will need to chose another Facebook user to be your Legacy Contact. Facebook will generate a short message to send to them, which you can customize. Your prospective Legacy Contact will receive a request, and they will need to confirm that they are willing to take on the duty. 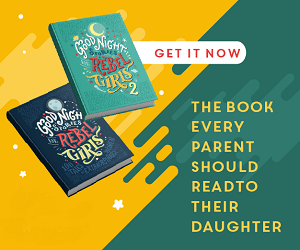 Taking a quick moment to make these decisions now can save your loved ones some grief down the way. So what do you think? Do you want to set your page to self-destruct after your gone? Or do you want to set up an executor who can go in and leave a final message? 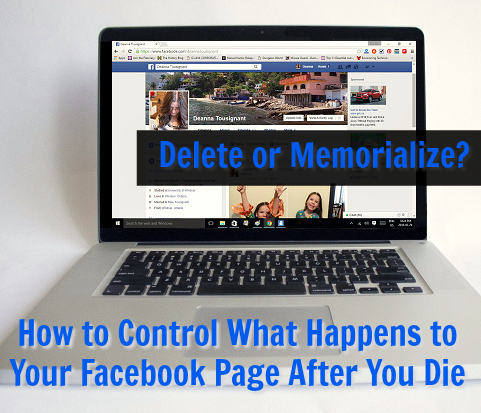 Would you prefer to have your page memorialized, or do you simply not care? This is a topic I dealt with personally just a month or so ago. My youngest brother passed away on Christmas eve after being in a horrific head-on collision. I had his Facebook page memorialized about a month ago and a so glad I did. Friends and family can still put their thoughts down and it's nice to be able to read all the kind things his friends say about him. I am so sorry for your loss, Nena. From my personal experience I agree, it is nice to be able to go back and see kind things people have written about those we've lost.